Assuming that the NACE International membership is representative of the overall corrosion workforce, knowledge transfer and education and training (E&T) of our younger workforce is critical. Based on the Corrosion Management System (CMS) survey, the top performers define corrosion management competencies as part of a career path for corrosion professionals and provide training for both internal and external resources. This core competency E&T internal to an organization is one way to address the aging workforce issues. A few organizations have gone to the establishment of internal “universities” with specific curriculum addressing corrosion core competencies. Two examples of best practices are a Middle East national oil company (NOC) and the U.S. Department of Defense (DoD), both of which have formalized internal “universities” for E&T. Corrosion management systems must focus attention on effectively transferring this institutional knowledge. These SME knowledge transfer programs will be different from the core competency development programs discussed above. Specific on-the-job training and mentoring programs are being used to transfer SME knowledge. 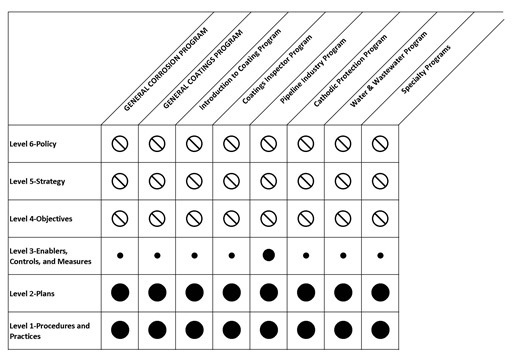 The following discussion of E&T is related to the availability of offerings at the various levels of the CMS Pyramid, and the relevant preventive strategies for the Management Systems Elements (see ‎Figure 7-1). Figure 7-1. 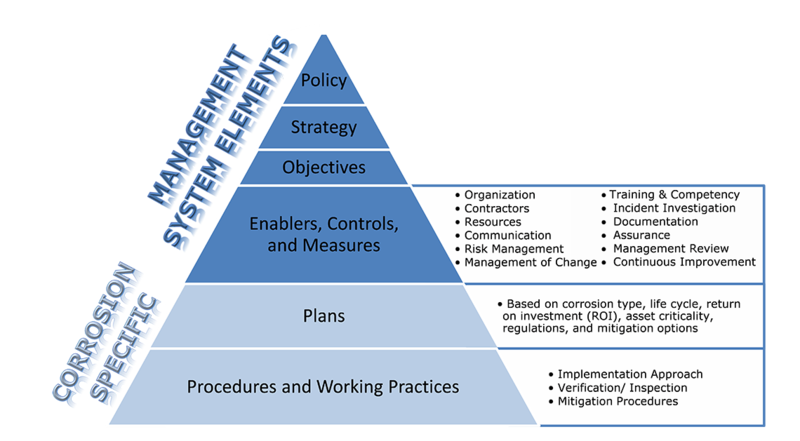 The Corrosion Management System Pyramid. In the university setting, corrosion is multi-disciplinary with contributions from materials science, chemistry, and electrochemistry. All deal with the corroding material, the corrosive environment, and the electrochemical reactions at the corroding interface. University faculty teaching corrosion resides in Materials Science and Engineering, Chemical Engineering, Mechanical Engineering, Chemistry, and others. Akron University provides the only bachelor’s degree in Corrosion Engineering in the United States and its first graduating class was in 2015. This program had significant support within the corrosion community and by the U.S. DoD; all realizing that a lack of corrosion professionals was going to become a critical barrier to furthering corrosion engineering and corrosion management in the future. Even with this corrosion engineering program, curricula primarily focus on science and technology of corrosion processes and mitigation and corrosion control, rather than corrosion management. This pertains to the foundational levels (1 and 2) of the CMS Pyramid, and there is little or none related to the mid and upper levels of the pyramid (Levels 3 to 6). The majority of professional development and vocational training for corrosion professionals is offered by NACE International. Over 16,000 students were trained in 2014 through 829 courses in 36 countries. Figure 7-2. Relationship of NACE corrosion education and training programs to levels of the CMS Pyramid. ‎Figure 7-2 indicates the level at which the various course materials provide education and training. The qualitative rankings in the figure are based on review of course descriptions, and the three sizes of solid circles indicate “significant,” “moderate,” or “modest” rankings. The open circles indicate that the courses do not address the upper three levels of the CMS pyramid. It is apparent that the E&T course content is heavily focused on the lower levels of the CMS Pyramid (Procedures and Working Practices), and that there is essentially no content at the upper levels of the pyramid (Policy, Strategy, and Objectives). Moreover, there is little or no content to inform those working in the foundation levels (Procedures and Working Practices, and Plans) on how to effectively communicate sound corrosion management to the Policy and Strategy levels. E&T will play an important role in the integration of corrosion management into an organization’s management system. E&T programs must prepare corrosion professionals to better communicate with those outside of the profession. Corrosion professionals should not expect outsiders to learn their technical language. In addition, corrosion professional societies must emphasize business strategy and/or public policy when advocating positions to those outside of the corrosion profession. Using the principles of CMS will make these arguments more persuasive. Level 3 (Enablers, Controls, and Measures) can be viewed as a transition/communication level bridging between corrosion management practices and policies, where corrosion management can be linked to an organization’s established management systems, such as health, safety, and the environment; asset integrity; performance; and profitability. Corrosion E&T programs at their most advanced levels touch on some Level 3 corrosion management issues; e.g., design, materials selection, performance, life-cycle costing, condition assessment, risk assessment, safety/reliability, and repair/replace/abandon. An observation that can be drawn from an analysis of the current E&T efforts is that the corrosion community spends a significant amount of these efforts talking among itself; i.e., on the important task of passing the knowledge of corrosion experts in practices and procedures on to the next generation of corrosion practitioners and experts, while it spends little time on E&T of corrosion professionals on speaking and presenting to upper management in a way that upper management understands (cost benefit, return on investment, risk reduction, etc.). E&T plays an important role in the integration of corrosion management into an organization’s management system. E&T programs must prepare corrosion professionals to better communicate to those outside of the corrosion profession. Corrosion professionals should not expect those outside the profession to learn their specific technical language. In addition, corrosion professional societies must address business strategy and/or public policy where corrosion management may have an impact. Using the principles of CMS will make these arguments more persuasive. Business communication can be defined as how to interact with other business entities in a way that is diplomatic but drives business and commerce forward. Training on business communication is lacking for the engineer. Another way to phrase this is that engineers need to learn to sell their projects (which may be technically sound and often innovative and promote state-of-the-art technology) based on “moving business forward,” not on the merits of technology only. The technology may be great, but eventually it will be a business decision that is made on whether to move it forward or to implement it. The American Society of Mechanical Engineers (ASME) promotes the art, science, and practice of multidisciplinary engineering and allied sciences around the globe. ASME says “….. modern business communication has been shaped by the information age. However, skills must be strong in nonverbal communication, as studies have revealed that posture and gesticulation can communicate more of an individual’s thinking than words.”1 Business communication E&T is a significant gap that must be filled to achieve the goals of integrating corrosion management systems into organizations on a broader scale. Moreover, the existing course content is heavily biased toward a limited number of industries, where corrosion is perceived to be a major threat. These include the oil and gas and pipeline industries, and to a lesser extent the chemical/petrochemical, power, and water industries. This trend is not unexpected, since corrosion E&T is a market-driven endeavor. More detailed discussion of the status of educational programs can be found in Appendix F.